When I first came to America and ordered a “flan” for dessert at a restaurant I got a little shock when the waitress placed a molded, wobbly, sweet custard, delicacy in front of me. Not wanting to display my ignorance I ate it all up, and licked my lips. It was delicious, but not what I envisioned when I read the word ‘flan’. I had a completely different notion in my head. You see, in Britain and Ireland, the term flan is used to describe an open pastry or sponge shell, filled with fruit and cream or some delicious savory filling. Now that’s an Irish fruit flan. See how confused I was. I love to make both kinds of flans now that I have lived in America for over twenty years. Today, let’s focus on the Irish sponge-cake version. I like to use mandarin oranges and kiwis to decorate this cake, mimicking the colors of the Irish flag (perfect for St. Patrick’s Day or any other Irish celebration). 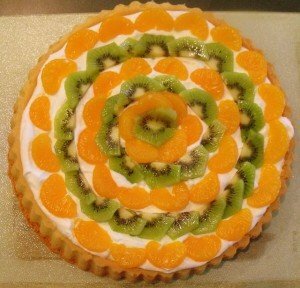 Fruit to decorate (mandarin oranges and kiwis work great for Irish flag colors). Pre-heat the oven to 375 degrees F, then prepare an 11-inch round fluted flan baking pan by spraying it with flour-infused oil. If you don’t have this spray, just grease the pan thoroughly with soft butter and then dust it lightly with a coating of flour. 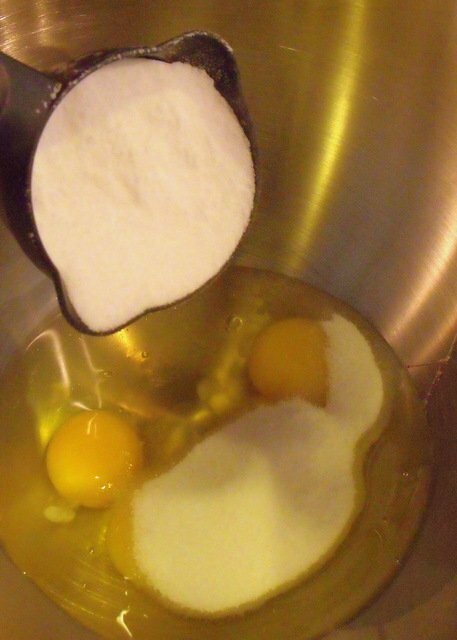 Break the eggs into a large mixing bowl and add the sugar. Make sure the eggs are at room temperature before whipping them. Cold eggs do not hold as much air. 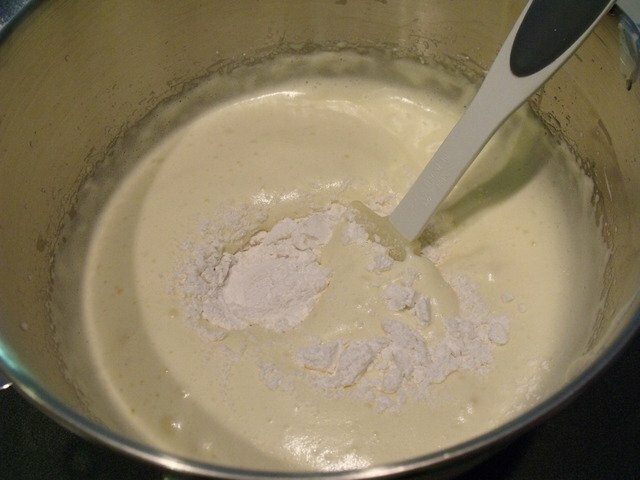 Use an electric mixer to beat the eggs and sugar together until the egg mixture has thickened and turned a very pale yellow. This will take anywhere from 5 to 10 minutes depending on how powerful your mixer is. You can always beat the eggs with a whisk but you will need a very strong arm, and plenty of patience, to thicken the eggs and incorporate enough air. Sift the flour and baking powder together. Use a large spoon or spatula to fold one third of the flour into the egg mixture. Do not beat it with a mixer at this stage. Repeat with the rest of the flour in two more stages..
Make sure you lift the egg mixture from the bottom of the bowl, to fully incorporate the flour and to avoid pockets of trapped flour. Pour the sponge mixture into the prepared flan dish. 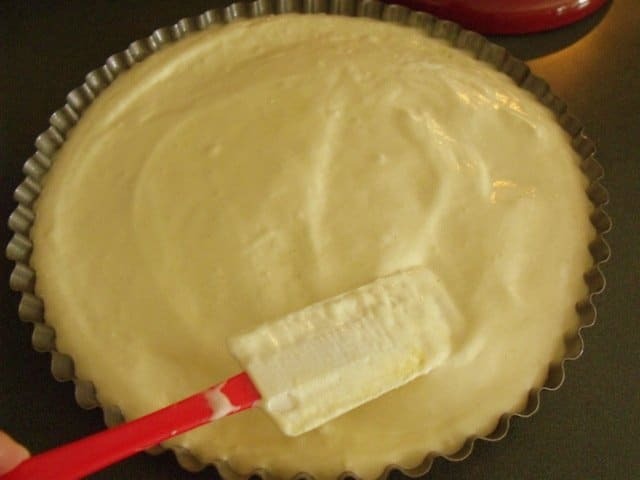 Use a spatula to spread it evenly. Place the baking dish into the pre-heated oven and bake for 25 minutes, until the top is golden brown. 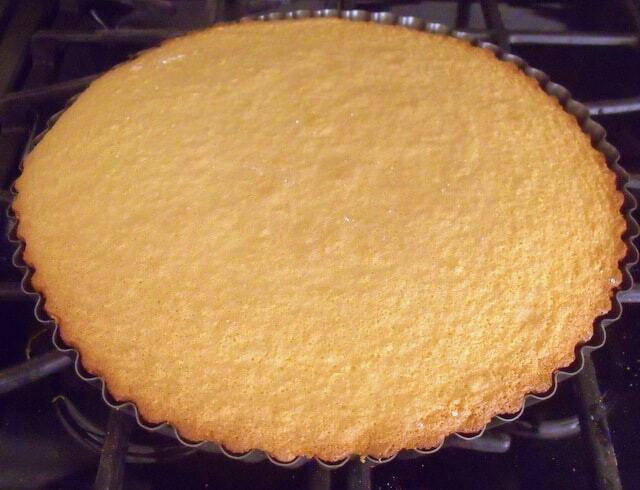 The center of the cake should feel spongy when lightly pressed (be careful not to burn your fingertips). Let the cake rest for 2 minutes, before turning it out on a wire rack to cool. Cool it completely before decorating. The sponge can be a little dry, so I use the juice from the mandarin oranges to moisten it. I avoid buying oranges that come in heavy syrup, since this is too sweet. Just drain the oranges, reserving the juice. Spoon it evenly over the sponge base. 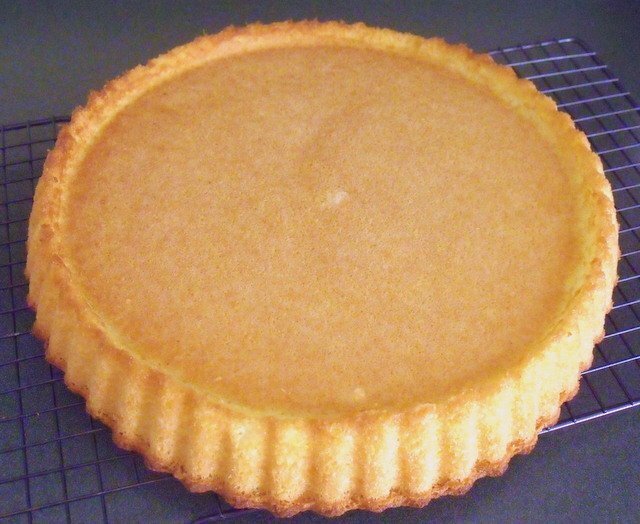 Fill the shell with whipped cream that has been sweetened to taste with confectioner’s sugar. 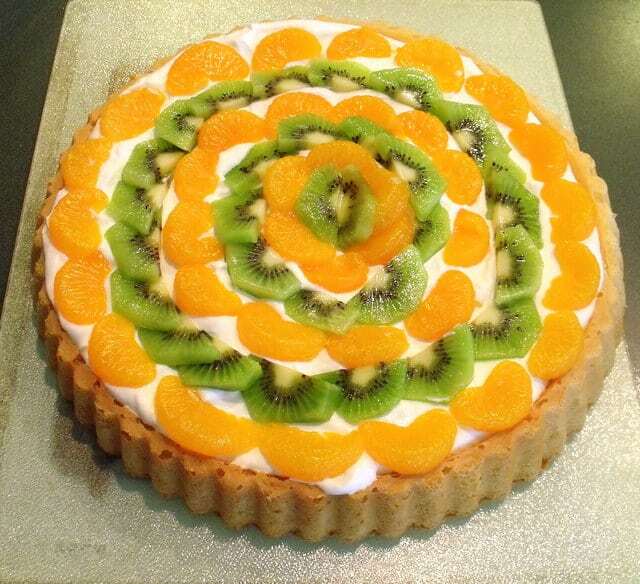 Decorate with the mandarin oranges and kiwis or any other fruit assortment you may like. 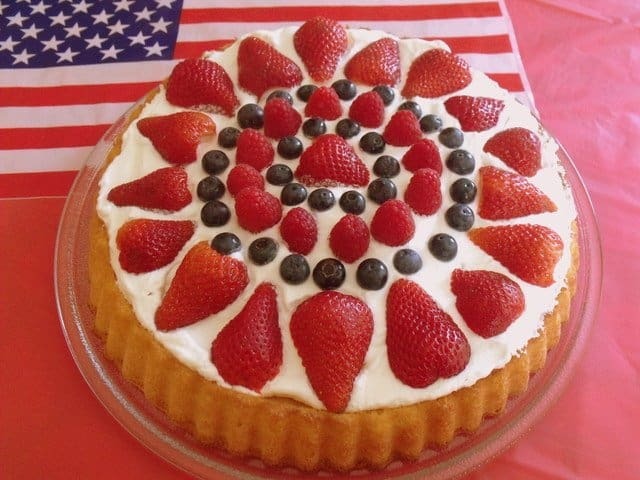 Here is one I made using strawberries and blueberries for a patriotic look on the 4th of July. 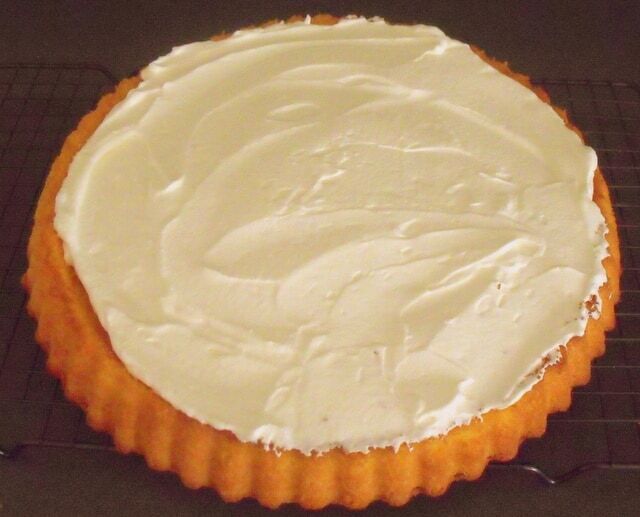 Since I did not have mandarin orange juice to moisten the base, I added a layer of jam beneath the cream. In Britain and Ireland, the term flan is used to describe an open pastry or sponge shell, filled with fruit and cream. This sponge is made without eggs, sugar and flour, with no added butter. 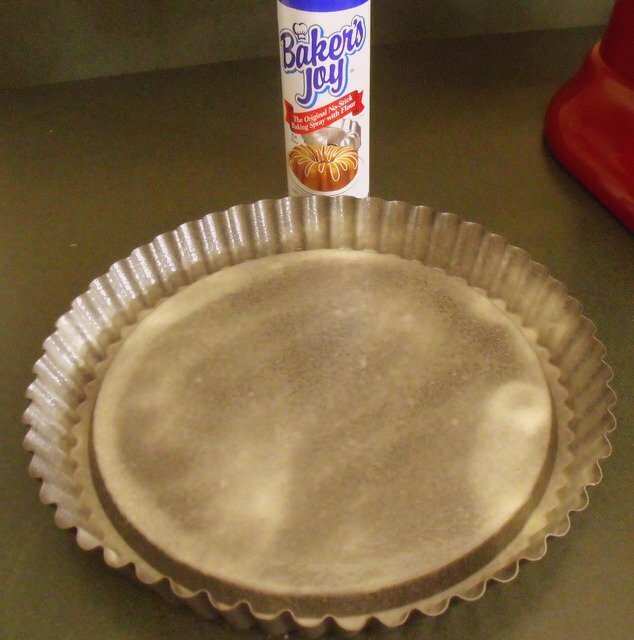 Step 1 Preheat the oven to 375 degrees F. Prepare an 11-inch round fluted flan baking pan by spraying it with flour-infused oil. Step 2 Break the eggs into a large mixing bowl and add the sugar. 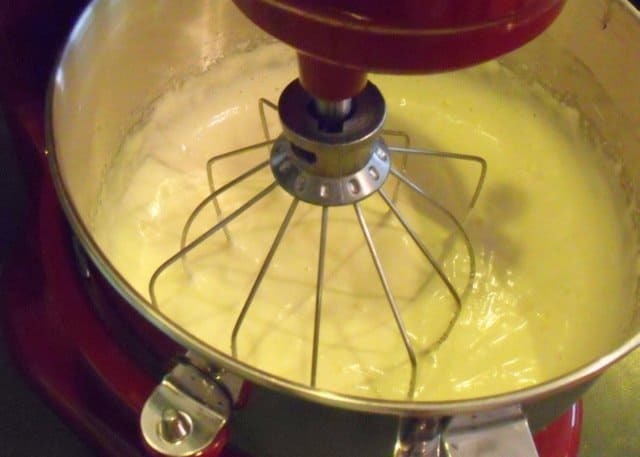 Use an electric mixer to beat the eggs and sugar together until the egg mixture has become very thick and turned a very pale yellow. Step 3 Sift the flour and baking powder together. Use a large spoon or spatula to fold the flour into the egg mixture, one third at a time. Step 4 Pour the sponge mixture into the prepared flan dish. Use a spatula to spread it evenly. Step 5 Bake in the pre-heated oven for 25 minutes until the top is golden brown. Step 6 Cool for 2 minutes before inverting on a wire tray to cool completely. 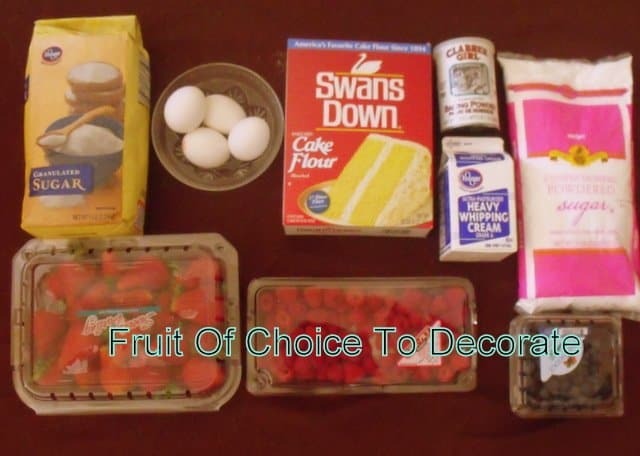 Step 7 Decorate with freshly whipped cream and fruit of choice. 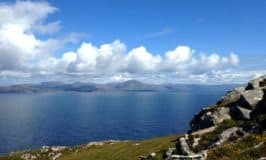 Hope you enjoy this little taste of Ireland. Hi Mairead, Looks delicious, food expectations are often lost in the translation. on my first buying trip to Dublin 15 years back or so, I found a lunch spot and wanting something quick I order chicken salad, I thought I would be getting a chicken salad sandwich but got a salad with some chicken on it. Makes all the sense in the world but boy was I confused when it showed up, and the waitress was amazed at how much pepsi I required. Brian – Love your chicken salad story – I remember the same type of thing happening to me in New York. When I left Ireland a salad to me meant a plate of cold cuts, with some hard boiled egg, lettuce and cheese on the side. I couldn’t believe the variety of salads on the menus of New York and then died of shock when I saw the massive plate of mixed greens and all kinds of fixins that arrived. I felt like Elaine in Seinfeld after she ordered her ‘big salad’. It’s funny how many cultural nuances exist around food. Raspberries would work great too, Cheryl, but I do recommend a layer of jam beneath the cream. Thanks for stopping by. Ah, you poor thing! Flan in America is almost always the Mexican ‘flan de leche’, or crème caramel. Thanks so much for your informative comment. American cooking is constantly evolving as it is influenced by different cuisines from the many immigrant backgrounds we all hail from. It is so nice to learn more about American cooking and how it has developed. Where did you get the flan pan from? The one I have is completely flat on the bottom. P.S. 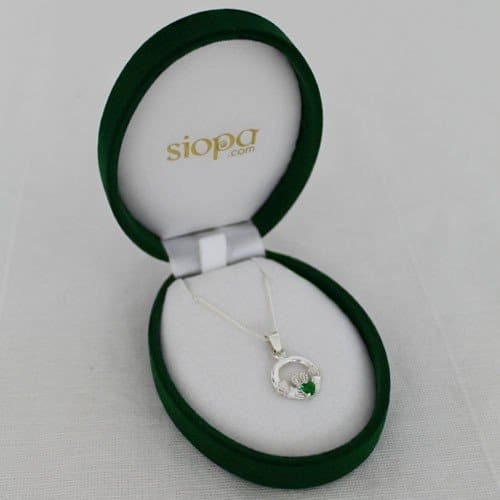 – I don’t have an Amazon affiliate link – I just find it a wonderful place for finding unusual items. I love your Irish sponge cake. It was just recently I’ve learned that I myself come from an Irish background. Its amazing how you mentioned that all the Irish do is boil pretty much everything Lol I do the same. I am not a fatty eater and love the Irish cuisine. Ty for providing us with the beautiful recipes from your homeland. Hi Monica – I’m so glad you like my Irish sponge cake recipe. It’s a great basic recipe. 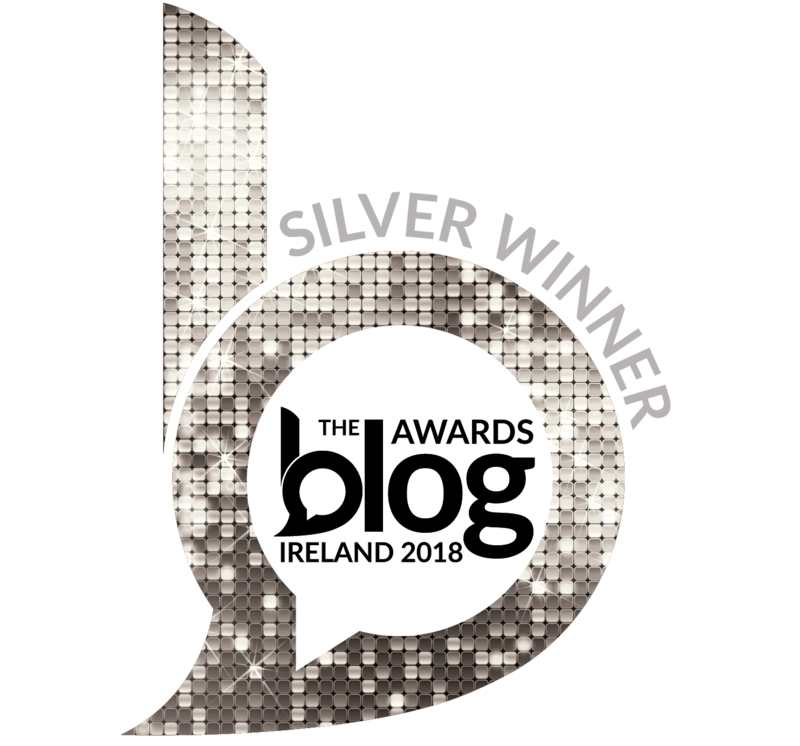 I grew up on Irish food, and no matter how many years I have spent sampling cuisine from all over the globe, my palate has been trained to really appreciate the plain, natural food of my homeland. Thanks for sharing, I am Irish by birth and American by choice. I love your site and recreating food from my childhood. I am originally from Dublin and left when I was 24 in the mid 80’s. I was wondering if you would have a recipe for a Dublin Coddle? Would love to try making one here. PS…. the flan looks great! Hi Rita – It sounds like we followed very similar paths in the 1980’s. I do have a recipe for coddle, but I like to use Irish sausages which I can get in a Celtic shop in Louisville. Sometime in the New Year I’ll try to cook it up and photograph the steps. It would be a good recipe to add to my blog before St. Patrick’s Day. Hi Mairead, When I was growing up, my Mom used to always make a flan. I think she learned it growing up in Dublin and the recipe was in her head. As she got older, the parties stopped and us kids moved out on our own so she stopped making it. She was about 90 when I asked for the recipe but she couldn’t remember it. She passed away last August and, while cleaning out the house, I found 2 flan pans! But no recipe. On and off I asked relatives in Dublin if they knew how to make it but nobody did. I just now decided to google Irish flan cake and found you. Now all my southern friends here in SC can taste what I’ve been talking about. My Mom always made it with pears on top, so that’s how I’m going to make it. Thank you so much for posting it. I’m absolutely thrilled!!! Hi Iris – I’m so happy to hear I was able to solve your search for an Irish flan recipe. 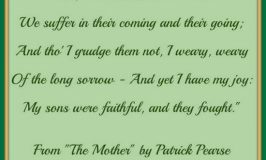 So sorry to hear your mother passed last August, but I hope every time you bake an Irish flan in her flan pans, your delicious treat will bring back happy memories of your mother and her Irish cooking. If you use a little pear juice to moisten the sponge it is extra nice. When using tinned pears some of the canning liquid is wonderful for this. 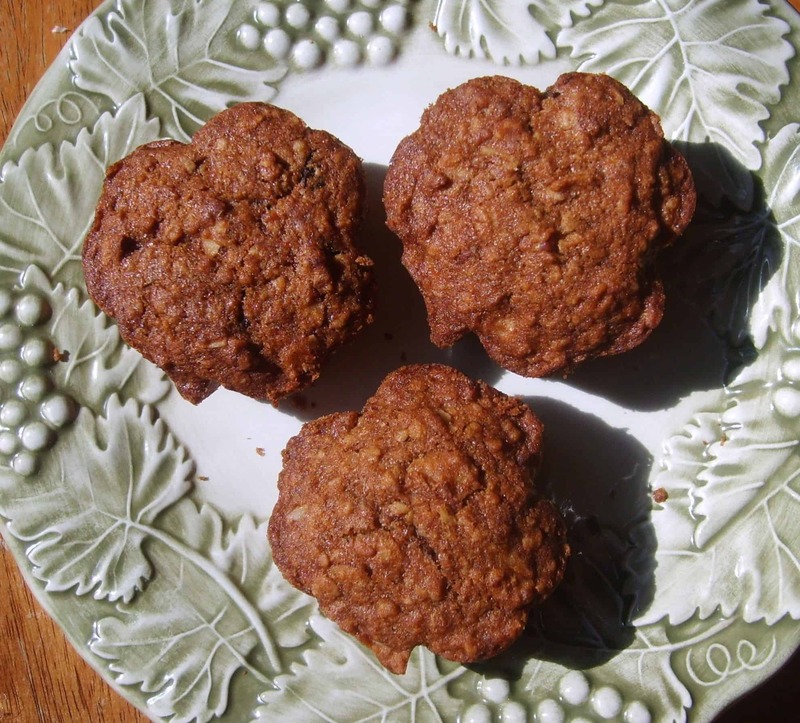 Happy baking, and thanks for checking out my recipes and ramblings. that pan is no longer available on amazon. I used to eat this flan during the summers I spent in Ireland as a kid and have been looking for this pan forever to make this for my kids !! Any thoughts ? ?